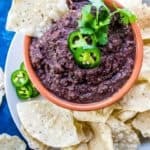 This Easy Bean Dip is super easy and flavorful--guaranteed to be a hit at your next gathering. Makes great wrap filling too! Place all of the ingredients except for the tomatoes and beans in a food processor or blender. Blend until smooth. Add tomatoes and beans. Process slowly to desired consistency - just a little for a chunky / salsa-like dip; a lot for a smooth, thick, hummus-like dip.